During the course of the 19th century ale glasses grew steadily taller than their Georgian predecessors as the brews which they dispensed became less and less strong and were therefore intended to be consumed in greater volume. Having been a relatively slow process over the first half of the century, this progression (or regression, some might say) gathered pace after 1880 following the abolition of the Malt Tax and its replacement by a system whereby the tax levied on a particular beer was in proportion to the original gravity of the wort - the alcohol content of the finished product, to all intents and purposes. The dark, brooding, malevolent ales of previous years become lighter in colour and altogether more refined, to the point where appearance itself became a marketable commodity. Glasses began to incorporate facets - notably in the pillar style of ale glass - which enhanced the luminous optical effects of the paler ales in an effort to make them more visually appealing to prospective customers, and to better exhibit the results of the brewer's craft. Brewing was keeping pace with broader industrialisation the world over, and the advent of pasteurisation ushered in significant new commercial opportunities, as ales could now be transported over longer distances without souring and breweries sought to identify, establish and popularise their own brands in an increasingly competitive market. Hence, ales glasses began to carry brewer's logos and names - generally acid-etched silk screen designs but also embossed designs using coloured glass, although this method grew less popular as automation engulfed the industry and plainer, pressed glass items rolled off the production lines. These products also tended to feature thicker, more durable glass to enhance longevity in the burgeoning public bar and restaurant outlets. For all the technological advances that had such wide-reaching ramifications throughout the century, though, it was engraving that most appealed to Victorian taste. 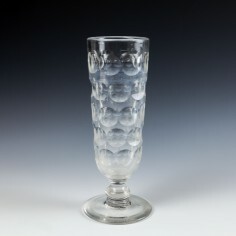 As a medium to convey the widely popular naturalistic and pictorial imagery on glassware it had no peer, and some exquisite examples remain, though as you would expect of such a labour-intensive process it tended to be reserved for commemorative, memorial or personally commissioned pieces rather than the commercial end of the spectrum. Engraving was, however, also used to apply "finishing touches" to cruder, pressed-glass pieces, though this tended to be reserved for relatively plain wordmarks or branding.